Everyone knows things go more smoothly when you’re organized. 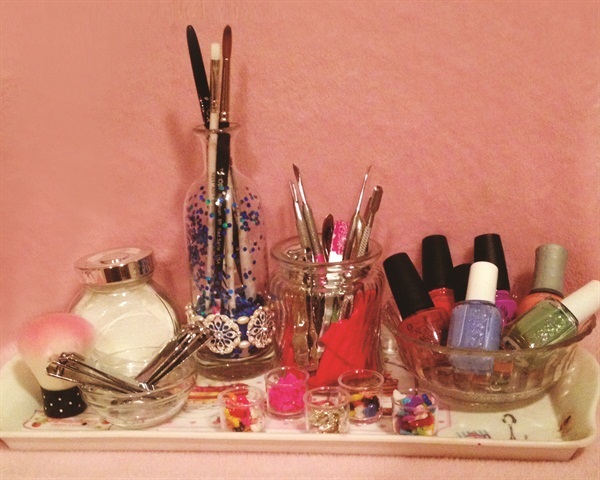 If your manicure table is overflowing with polishes, implements, and glitter, give these ideas a try for putting everything in order. We store all our buffers, files, lotions, scrubs, etc. 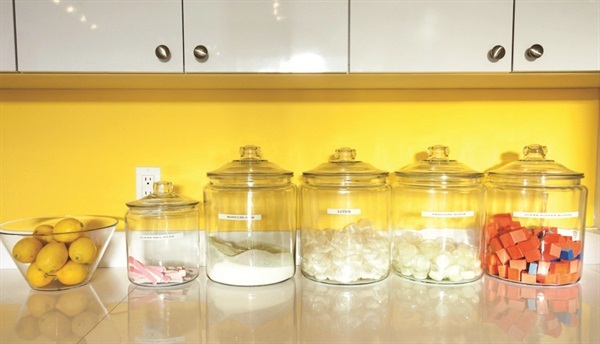 in cute cookie-like jars, and that way the clients see they are new and in a sanitary container. Melisa Bruce, Sugar Rays, Hermosa Beach, Calif. I have “The Art Wall.” I like to have everything out so my clients can see what their options are. Rachael Waggoner, Dazzlin’ Digits, Lakewood, Colo. I use a magnetic pin board. I glue a magnet on the back of all my glitters and pigments to hold them up. I clip all my foils together and hang them off a pin on the board. I have a pretty big collection of gel-polish colors because that is what makes up the bulk of my services. At first the bottles looked fine in a single line on shelves, but as my collection grew, I knew I would need a more permanent and tidy looking arrangement. This shelving unit is perfect and sits directly behind my chair. This type of shelf with the square openings is very affordable at Target. I found the baskets on the bottom shelves for $6 each at TJ Maxx. I use them to store cotton, files, foils, and the larger containers of product that refill the small ones I keep on my desk. 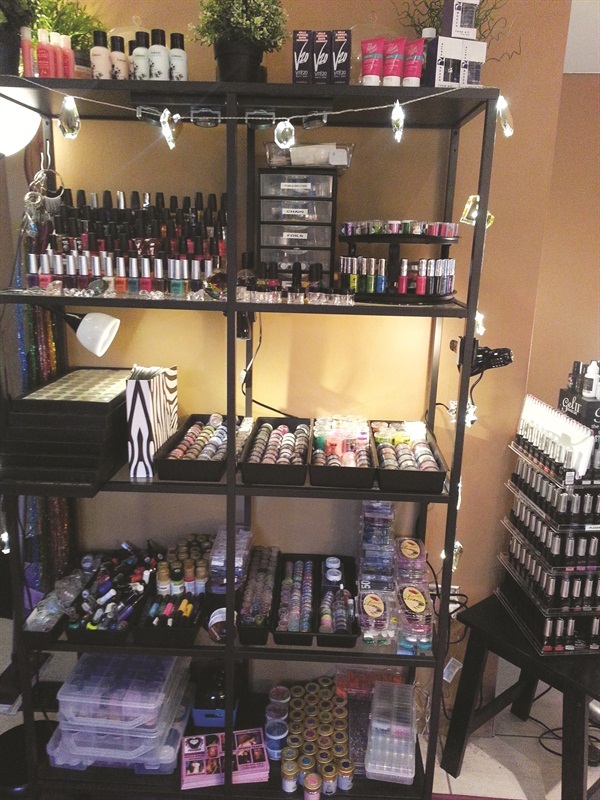 The racks that hold the polishes are available for very little and are often free at a local supply shop. They always have extras from old displays and are happy to part with them. 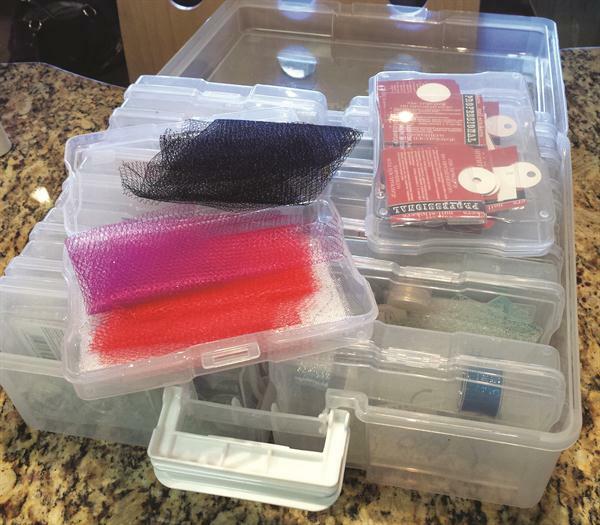 With a collection of nearly 200 colors, this system works well for keeping everything tidy and easy to find. As my collection grows, I just add more racks. I keep them loosely organized by color or brand. I keep all my tools, brushes, and polishes in glass containers. It helps keep everything neat and ready to use. Daniela Manzano, The Fountain Spa, Hackensack, N.J. 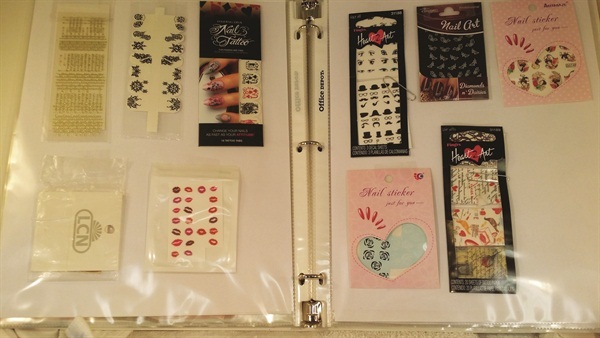 I gathered all my stickers, nail tattoos, gems, and nail art supplies. I used an everyday binder and simply taped the supplies to a piece of paper and placed it in an insert. If you have time, you can label and organize everything by color, theme, or application technique. I use a photo shelf I found at a thrift store to help store my colored acrylics, stripers, and polishes. 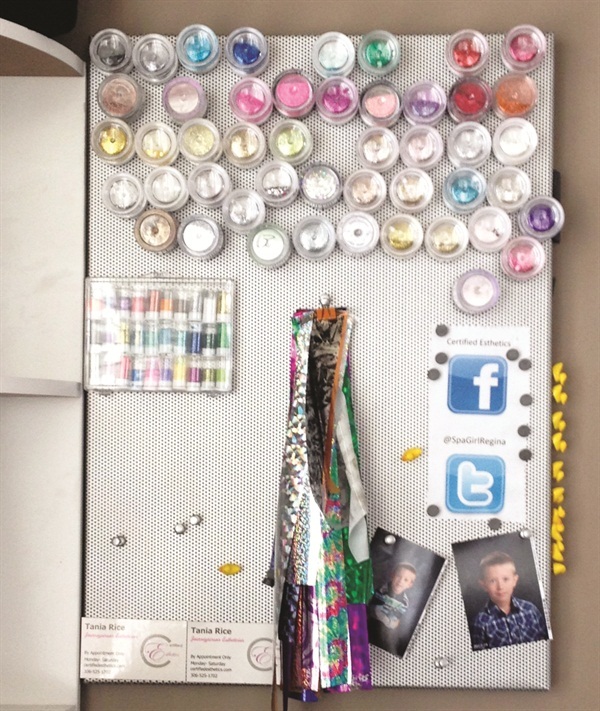 Next to my desk, I use spice racks to organize paints, glitters, foils, and gel-polish for easy access. The neatest thing, I think, is the rotating flatware server I found at Hobby Lobby. 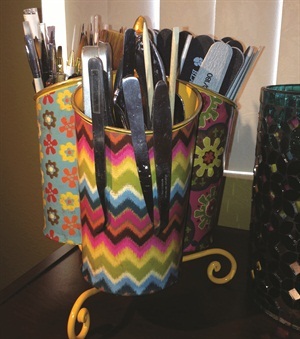 It’s awesome for my paintbrushes, implements, and files. It also came in this really cool multi-pattern design, which I sometimes use to inspire my nail art. Veeah Chitwood, The Salon By Veeahs World,, St. James, Mo. My storage solution is using my old candle jars. The ones with the lids I left alone and use for my arbor bands, lace, gold flake, and snakeskin. 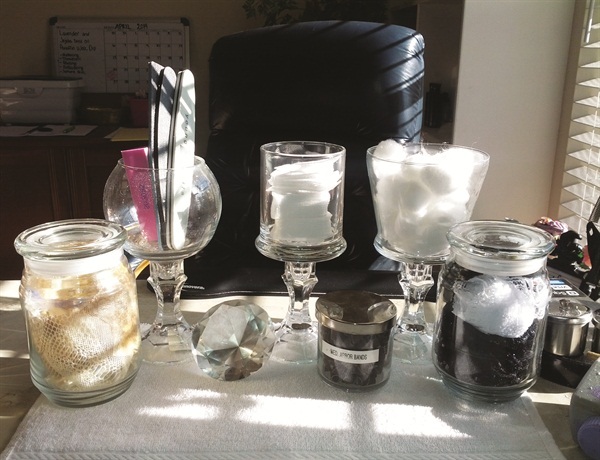 On the decorative glass jars, I used E-6000 to glue them to dollar-store glass candlesticks to give them height and make them look less like candle holders. Those are where I keep files, cotton balls, and lint-free nail wipes. 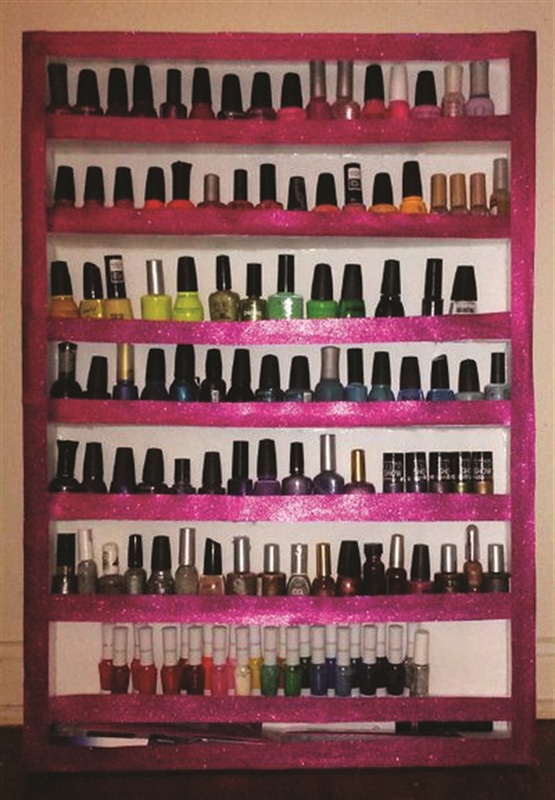 This is a cute and convenient nail polish rack that I created myself using foam board, hot glue, and decorative glitter paper. Not only does my DIY rack organize my polishes, it also allows me to have them on display and even serves as a stylish interior decor piece. I never leave without this awesome little black bag. 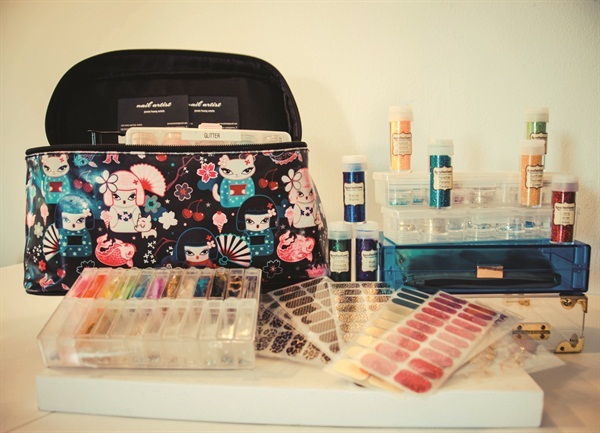 It has all my essentials — everything I need to do my manicures and nail art. Also, I never leave without the clear container that has all the products I need for a mani, pedi, nail art, and nail repairs. It’s my emergency nail kit. All the products in that container are my top faves: Spa Ritual, CND, Butter London, Gelish, and Dashing Diva. Jennie Hoang-Sotelo, Queen Bee Salon Spa, Culver City, Calif.
We chose this tiered cake plate to hold our polishes because it makes them easily accessible to clients and it looks cute sitting next to the plate of homemade mini cupcakes we serve. Clients love to relax and enjoy a complimentary beverage and sweet treat while they choose their polish colors. Misty Senske, Kréme de la Kréme Nail Lounge, Long Beach, Calif.
For my materials (netting, stickers, etc. ), I use a container that is able to be mobile. If I am traveling and need certain stickers or material, I can take it on-the-go with these individual boxes. Diane Self, Simply Ravishing Salon, Gilbert, Ariz.